Just because Metal Gear Solid: Rising is focused around a cyborg samurai doesn't mean it won't feature stealth-focused gameplay. 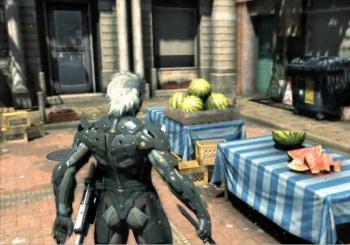 Konami's Metal Gear Solid: Rising is a series spin-off that focuses on Raiden, a cyborg ninja of sorts, instead of stealthy camouflage master Snake. It's said to be more of an action title than previous Metal Gear efforts, with Raiden shown at E3 slicing the hell out of everything with his nano-sword, but the game's creative director Shigenobu Matsuyama says that Rising is still a stealth game too. It's just that the stealth in Rising will be an evolution of what we saw from Raiden in Metal Gear Solid 2 and from Snake in every other version of the game. Thanks to what Matsuyama calls Raiden's "super abilities" and his "high speed," players will engage in "team hunting stealth" rather than running around cutting enemy soldiers in half all day. "[Raiden] is very high speed and acrobatic," Matsuyama told Videogamer. "So, you might ask, where's the stealth? But, using his super abilities, his high speed, we call it the team hunting stealth. So you're not going to wait for the soldiers to pass by, you're going to aggressively hunt without getting spotted." Matsuyama wants to show players why they should enjoy taking on the role of Raiden, as opposed to when many were incredibly upset over his replacement of Snake as a main character in MGS 2. "It's a new type of stealth, but it's still a stealth game," he continued. "With the katana, zan-datsu battle, and this stealth element, this is what I really wanted to accomplish for Rising, and when players play they will probably go 'Oh, I can't play this kind of style with Snake' so I'm very confident they'll be satisfied.'" Matsuyama also said that he plans to prove that Raiden isn't the whiny brat people think he is by showing off the "strong parts of his mental state." He says: "And don't worry, we're going to try and make him not the weak Raiden, but really strong willed, and physically strong - make it really cool, so that people really will really enjoy controlling him." That's great and all, but I really just want to slice lots of guys in half as shown in the E3 trailer. And make fruit salad.